Slightly late to the table here but happy new year everyone! I have been commissioned to paint a floral painting which I am thrilled about as flowers are my favourite subject to paint. I will keep you updated on here of my progress. 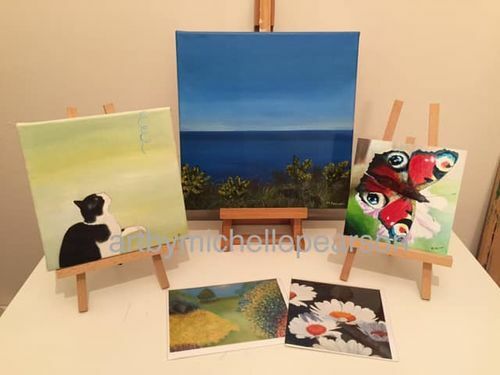 I am running a Mothers Day Competition on my Facebook page - https://www.facebook.com/ArtbyMichellePearson/. I am delighted to say my original art work and a selection of my greeting cards can now be found at the Suki Gallery in Tutbury, on the Derbyshire/Staffordshire border. This is an independent ART gallery, providing various British art and hand crafted items, ranging from paintings to sculpture, from jewellery to glass. My current floral commission is almost complete now. I am very pleased to tell you I have my second commission of this year ~ to paint a beautiful dog. My floral commission is complete and I am delivering it this weekend. I will post a photo on here next week. I delivered my floral painting to my client today and I am happy and relieved to say she really liked it.